For a better cause, Alleluya Band is back after a three-month tour of Italy. Left Malawi on May 26 with a single reason- raise funds to boost health services delivery for Comfort community hospital in Malawi’s southern region district of Balaka. Band leader Coss Chiwalo says they managed to hold about 37 shows out of the total 43 planned, attributing the failed six to bad weather. He said people however patronised their shows convincingly. According to Chiwalo, Alleluya Band has learnt some skills after sharing stage with renowned Italian musician, Zucchero Sugar Fornaciari. 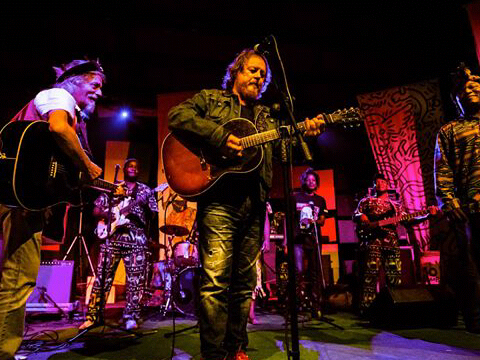 Zucchero left one of his shows, to join Alleluya band in a campaign against Malaria and pneumonia in Malawi. The Alleluya Band leader disclosed that a new twelve-track album titled “Mbambande Malawi” is out. “Mbambande Malawi” is a compilation of different songs composed by several artists who have been members of the band previously. These include the likes of Sir Paul Banda, The Reggae Ambassador Charles Sinetre and Isaac Liwotcha. “Mbambande Malawi” album is named as part of commemoration for 50 years of Malawi’s Independence from the colonial rule. According to Chiwalo, Alleluya band is set to offer its fans live shows starting this month of August, after a two-week holiday. This entry was posted in Culture and Sport, News from Malawi and tagged Alleluya Band, Zucchero Sugar Fornaciari. Bookmark the permalink.